'ZAMUKA MUTEGARUGORI' is a group of women who has joined together to aim for auto-promotion. The members are all women: some are widow, others single, others cast away from their community, some are seropositive, have aids and the majority did not go to school. Potato cultivation in the craters of the mountain range Congo Nile. 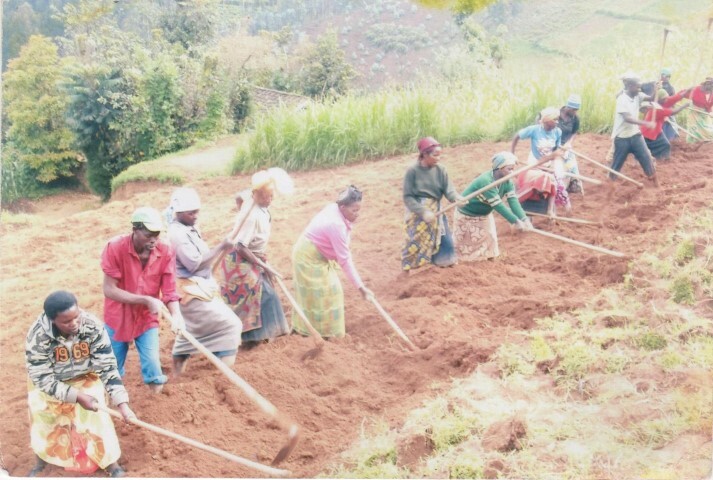 The projects aims to multiply the selected potato seed variety Kinigi, on a surface of 1,5 ha over a period of 4 years (2 seasons per year). There will be cooperation with RAB (Rwanda Agricultural Board) station SIGIRA for the acquisition of basic planting material. Zamuka will take care of the multiplication. The multiplied planting goods will be sold to farmers and potato producers. The members of the association Zamuka Mutegarugori. The farmer women of sector Uwinkingi and surrounding sectors. The people in the shelter “Moeder der Armen” in Kitabi. Lack of needed funds to start the project. On December 1st the board of Vleugels van Hoop vzw met the responsible person of the project, Genevievie Uwimana, in Gitarama, Rwanda. The cooperation agreement was signed and the funds were given in cash, being € 3.500. The project will soon start. Lack of seed. We had proposed the kind of KINIGI, but the seeds were not available. Even if available we had not terminated the culture. We chose a different kind, i.e. KRUZA, adapted to the region and the result is good as seen in the photos. As we previously have foreseen, we have been lucky that we have found the variety KINIGI, which we had not found for the season 2015A. During the season 2015B there was a lot of rain, we needed seed that could resist such as the kind of KINIGI, this species is very expensive. The association ZAMUKA MUTEGARUGORI has grown, potatoes from the end of january to early February (variety KRUZA). These are harvested early june with a good production of 8.2 ton/80 are. Because of the rains, more pesticides were needed, notwithstanding was at least 1.6 ton rot. 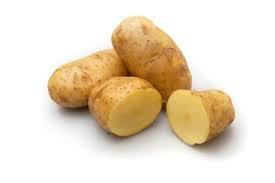 However, the association did not go bankrupt, on the market is much demand for potatoes, which can be sold to 180F/kg. As agreed in december last year we would bring potatoes to the center of Kitabi. We have done that on sunday 14/06/2015. We were 6, including little Emmy and 4 members of the association. We have given the Center 300kg of potatoes. We thought of more but the risk of rot is too large. 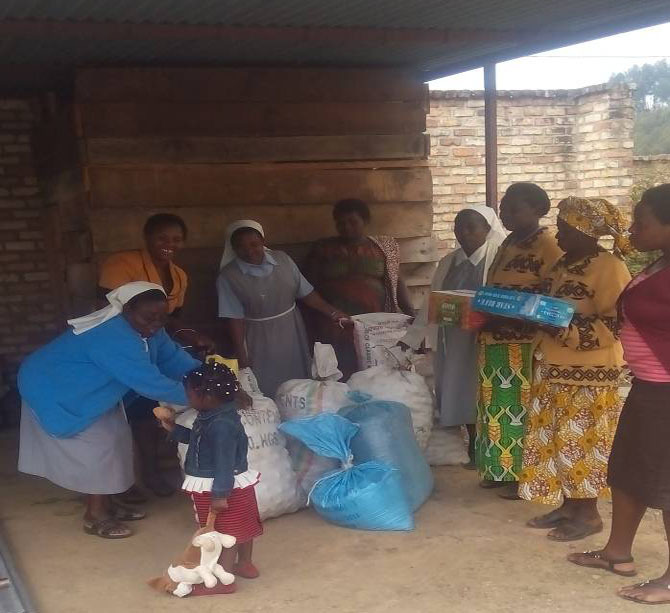 Therefore, we have sold potatoes so that the center could buy : 50 kg of maize flour ; 50 kg beans; 25 kg sugar ; 6 liter oil; a cardboard soap and a cardboard biscuits. Since our members also cultivate fruit we have given to the Center 20kg plums. All the members of the Association have been given 50kg potatoes for their own use, a part was sold on the market for saving and the rest is stored as a future seed. Conclusion: the production was good, and after a visit to the Center, the association will also in the future donate potatoes to this Center. Due to the weather conditions the plans as mentioned in previous report (beginning of september) are not realised (variety KRUZA). This is done at the end of October and early november because of a lack of rain during the previous months. Not only the first field of 80 ares is treated but also the second field of 70 ares (both are rented for two consecutive years). It should be noted that the value of the field is not included in the table because this is already paid. The same applies to the seeds, the association has used its own seed : 1400 kg/80 ares and 1200kg/70 ares (or 1kg to 400 Frw).